Preet Bharara on Sheldon Silver: The prosecutor could prejudice a jury. Preet Bharara is an entertaining speaker, but he goes too far. 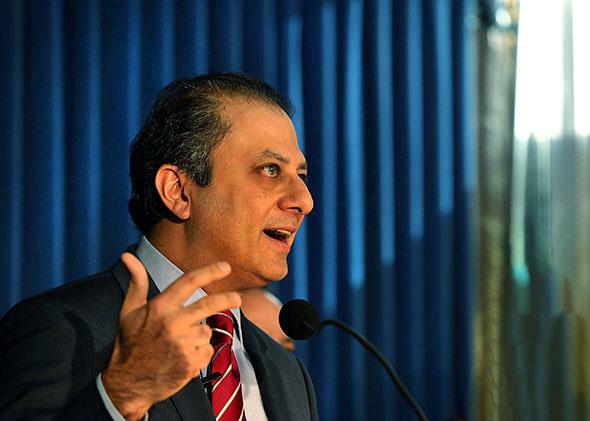 Preet Bharara speaks at a press conference on Jan. 22, 2015, in New York City. Prosecutors should prosecute, not proselytize. But U.S. Attorney Preet Bharara apparently plays by different rules than most prosecutors. He has a penchant for public speaking and seems to revel in discoursing on political theory and the requisites for effective democracy, railing against greedy and corrupt malefactors—from Albany, New York, lawmakers to Wall Street traders—and occasionally mocking them with stand-up comedy. Bharara is an adept and entertaining speaker. But given the considerable power, and the respect and acclaim he enjoys with the public, he ought to be especially careful about expressing opinions. His comments have the potential to unfairly prejudice the public against individuals his office is prosecuting and undermine the public’s confidence that justice is being administered fairly and impartially. To protect a defendant’s right to a fair trial, an array of ethical rules circumscribe the kinds of comments a prosecutor can make. Several of Bharara’s public comments appear to have violated these rules. Federal and New York ethics rules authorize a prosecutor to explain to the public the criminal charges filed against a defendant, but the rules prohibit a prosecutor from making subjective statements that assail the character of a defendant or from insinuating opinions about the defendant’s guilt. Some of Bharara‘s public statements have done just that, and they may have contaminated the ability of people who might be selected to serve on juries to evaluate the evidence dispassionately and render fair judgments. Bharara’s prosecutorial accomplishments are impressive. His office has won an unprecedented number of convictions against corrupt state lawmakers and dishonest financial traders. His office’s recent indictment of Sheldon Silver, the powerful former speaker of New York state’s Assembly, has added to Bharara’s prestige. He is viewed by the public and the media as a champion of honest and responsible government, a protector of the public trust, and the scourge of lawbreakers. It is therefore surprising that he would risk ethical criticism and possible censure by making gratuitous, demeaning, and prejudicial comments that could manipulate public and media opinion and ultimately prejudice juries that will hear cases he brings. He could not make such comments in a courtroom; a judge would stop him. But there is no judge to check his extrajudicial statements. Press conferences, as Bharara well knows, afford prosecutors a unique opportunity to inflame public passion. Indeed, Department of Justice guidelines warn federal prosecutors to use press conferences sparingly, to speak with “prudence and caution,” and to take “particular care to avoid any statement that would prejudice the fairness of any subsequent legal proceeding.” Federal and state ethical guidelines and directives uniformly recognize and condemn prejudice, which includes expressing subjective opinions about a defendant’s character and guilt. All trial lawyers, including Bharara, know that assailing a defendant’s character can potentially inflame public opinion against a defendant and ultimately prejudice a jury. Later, in a wide-ranging, two-part conversation with a reporter, Bharara made similar comments, stressing that Silver’s arrest was a “big deal,” going on to say that “when you see somebody who has basically sold his office to line his pockets and compromised his integrity and ethics with regard to how to make decisions that affect people’s lives, that’s a big problem. And it’s a big problem for democracy.”* Bharara acknowledged that his observations about Silver may have been said out of “frustration.” But Bharara is a prosecutor, and he should know better. He surely knows that expressing such an opinion would, in the language of federal and state ethics rules, create a “substantial likelihood” of prejudicing Silver’s ability to receive a fair trial. Clearly, based on his comments about Silver, Bharara did not heed Karas’ admonition. Reflecting on Bharara’s penchant for aggressive and inflammatory oratory, one is reminded of the famous dictum by President Theodore Roosevelt: “Speak softly and carry a big stick.” This utterance became the trademark description of how Roosevelt believed U.S. foreign policy should be conducted. But it could just as easily describe the ethical responsibility of a prosecutor. Prosecutors carry huge and powerful legal weapons and are authorized to use them aggressively to convict wrongdoers. They do not need to augment these awesome powers by irresponsible extrajudicial commentary that tarnishes their role to serve justice fairly and has the potential to destroy a defendant’s right to a fair trial.